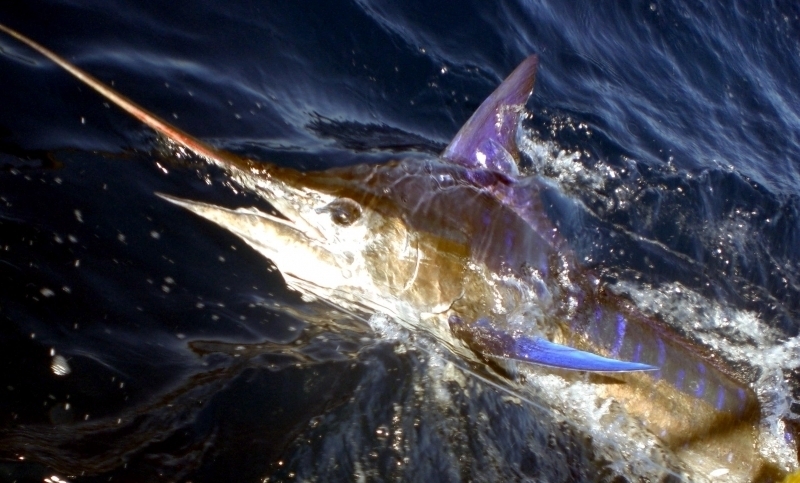 The Blue Marlin is a fish that can be easily recognized. 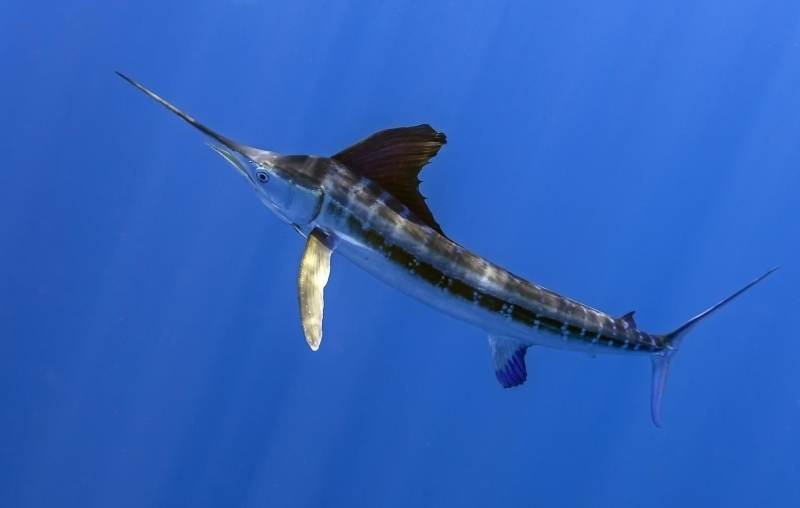 This majestic creature lives in temperate and tropical waters of Atlantic, Indian & Pacific oceans. 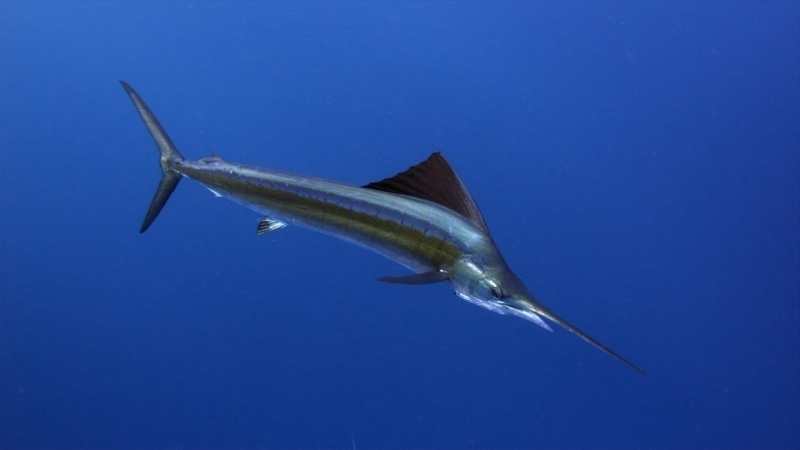 Blue Marlins are able to swim close to the surface of the water or to dive to the great depths while it searches for food. 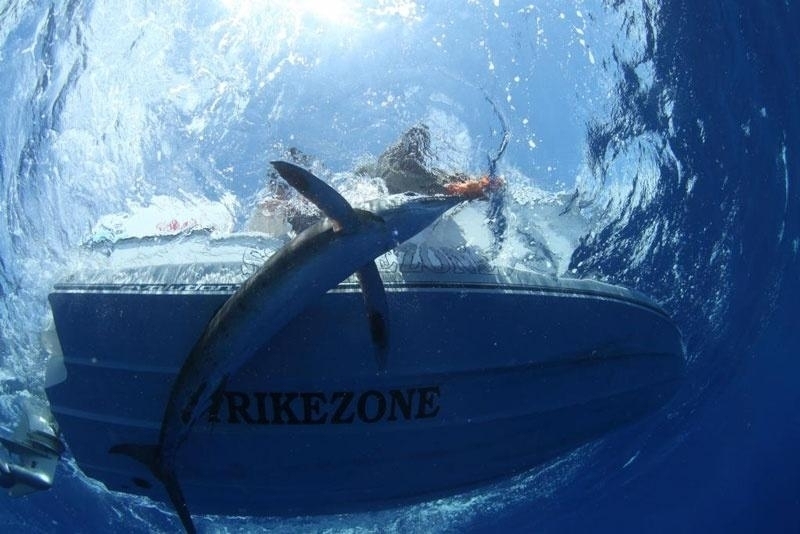 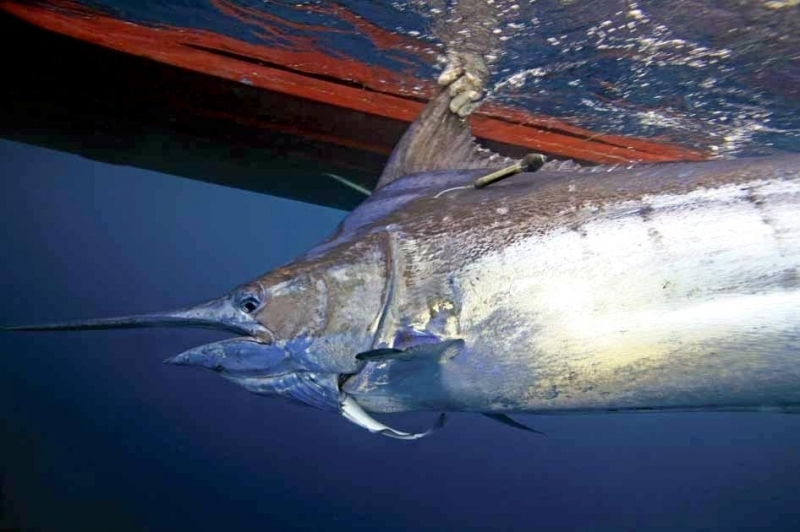 Major threats for the survival of Blue Marlins are increased boat traffic which leads to accidental collisions, over-fishing and accidental by-catch with other fish species, especially tuna. 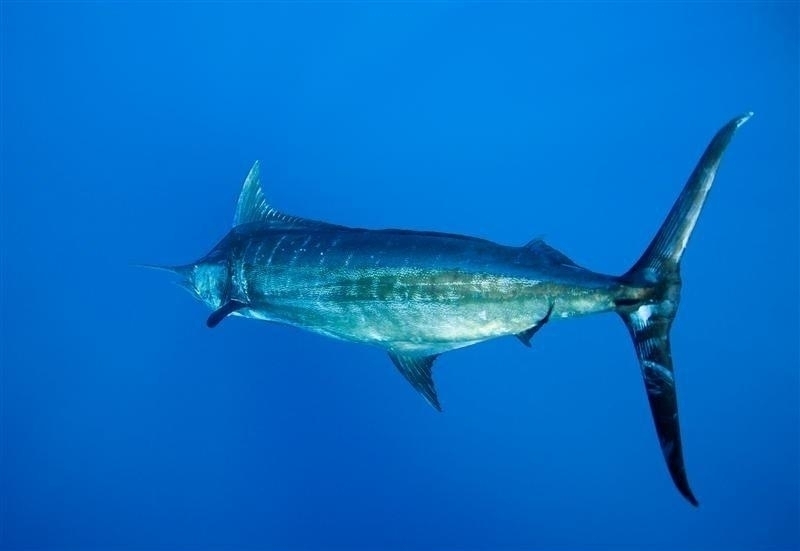 Blue Marlins are not on the list of endangered species, but they may become endangered in the near future due to uncontrolled fishing and pollution of the ocean. 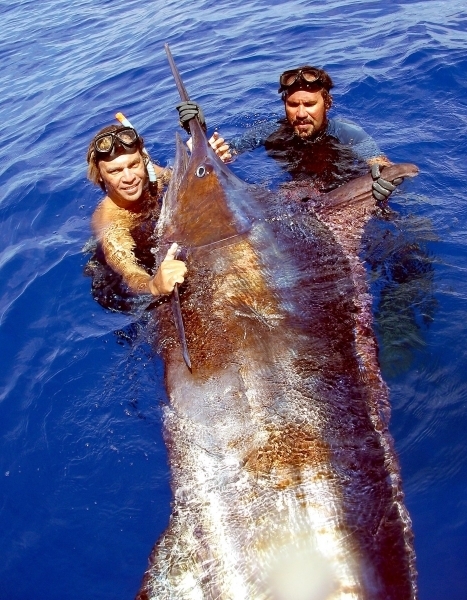 * The Blue Marlin is very large fish. 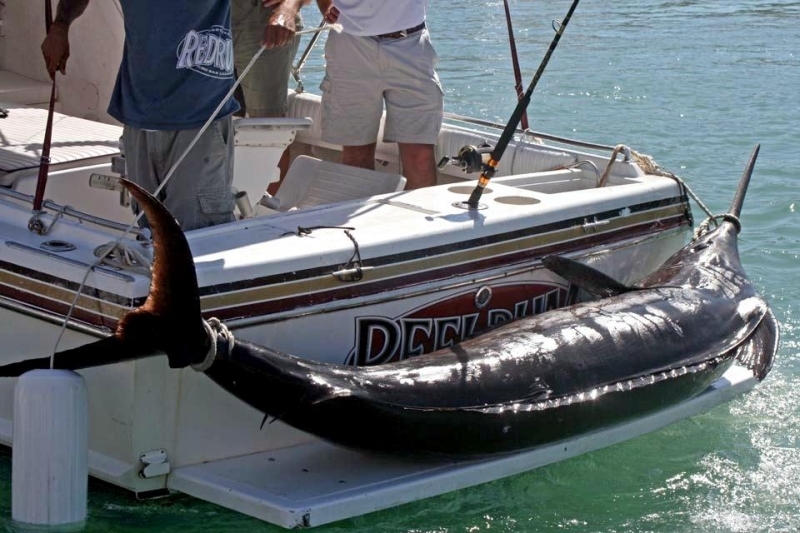 Females are than males and can reach 14 feet in length with a weight of almost 2,000 pounds. 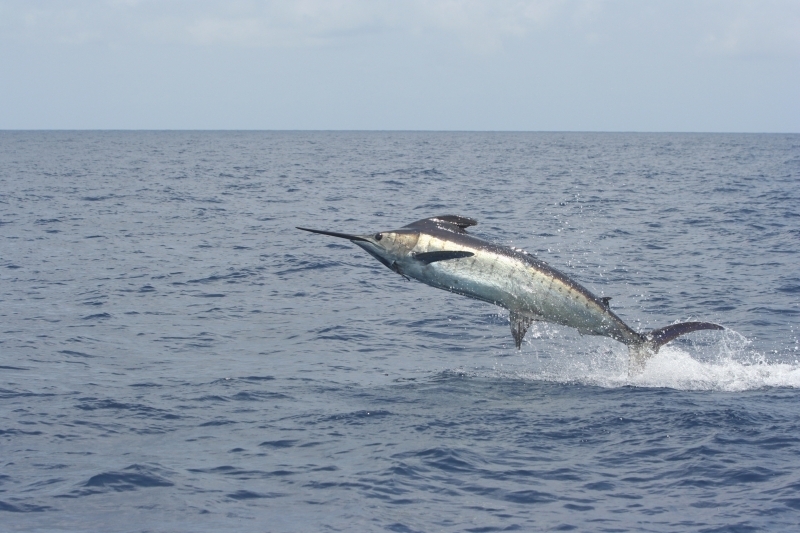 On average, Blue Marlins usually reaches 11 feet in length and between 200 & 400 pounds in weight. 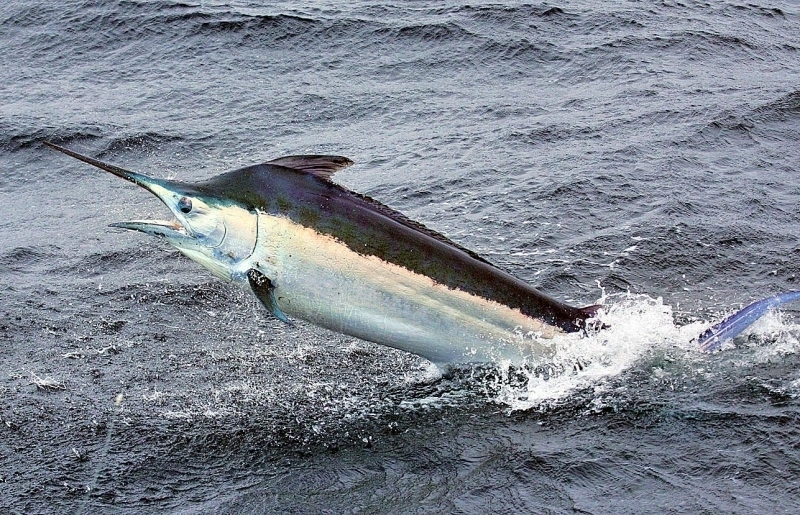 * Dorsal (back) side of a Blue Marlin is dark blue while the belly is silver-white in color. 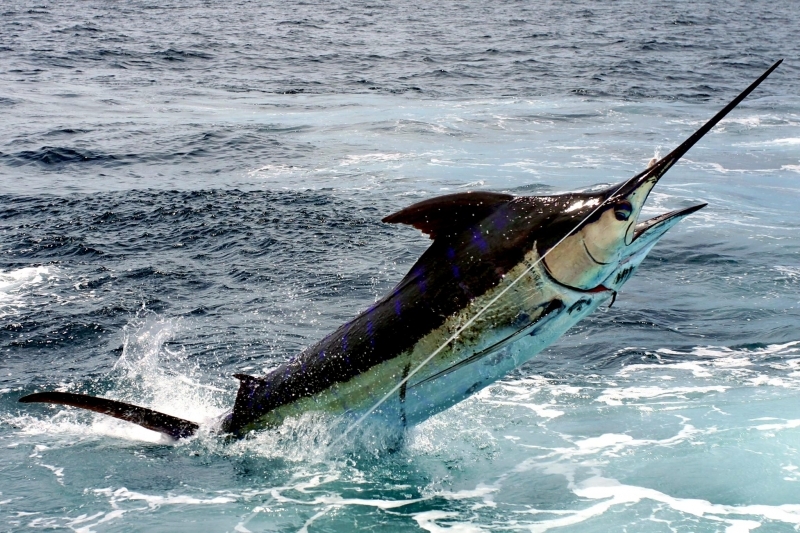 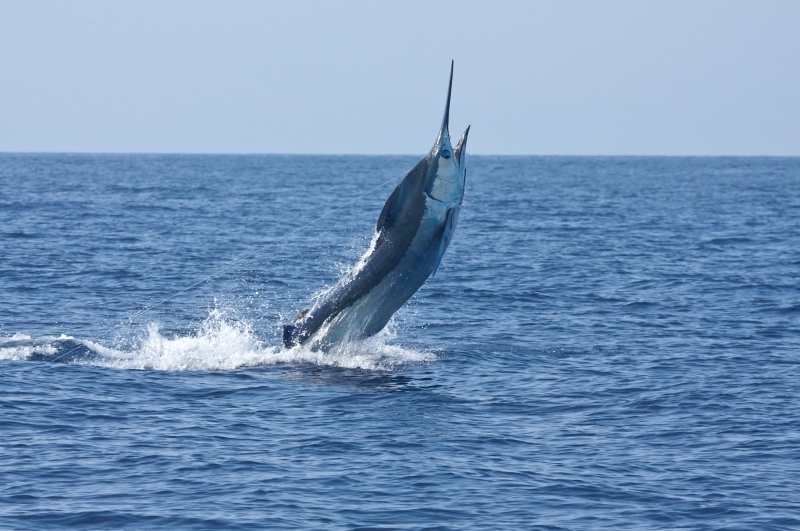 * The Blue Marlin has elongated body, long tail, pronounced dorsal fin and sharp, spear-shaped upper jaw. 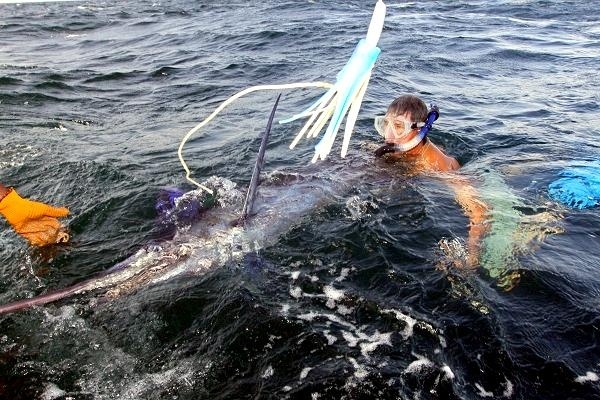 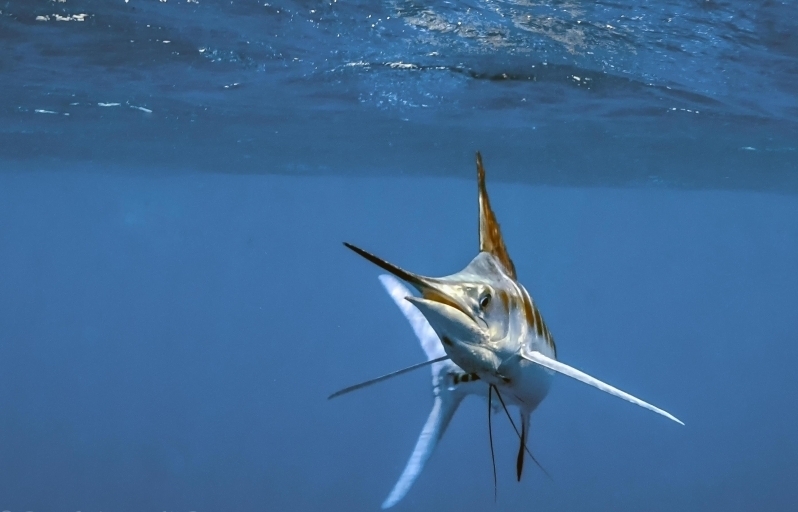 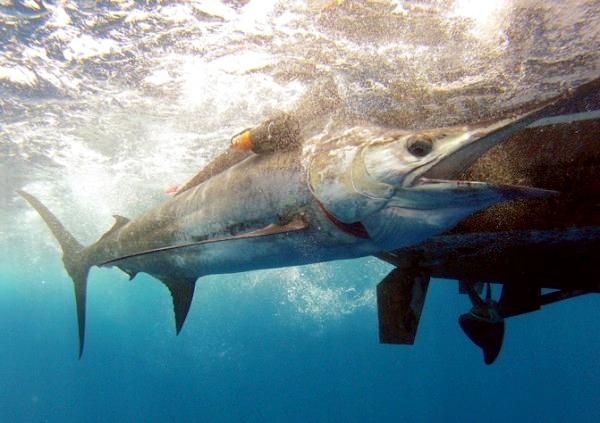 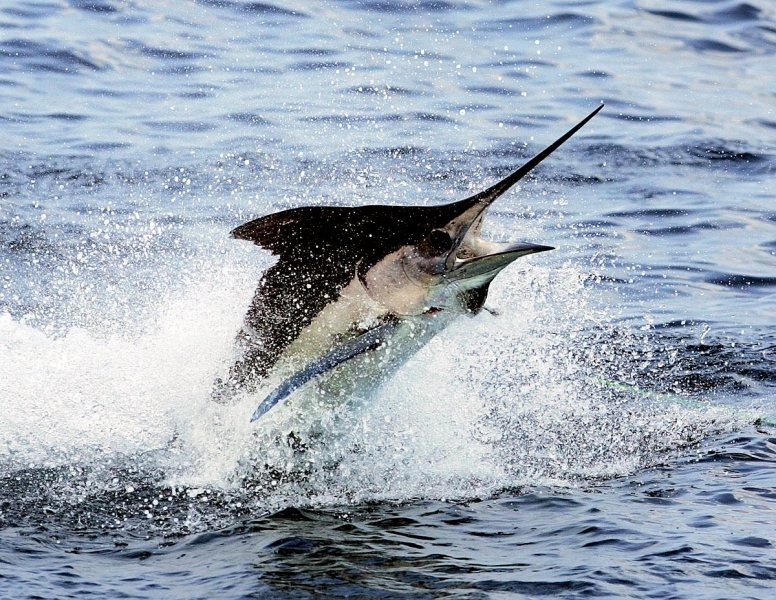 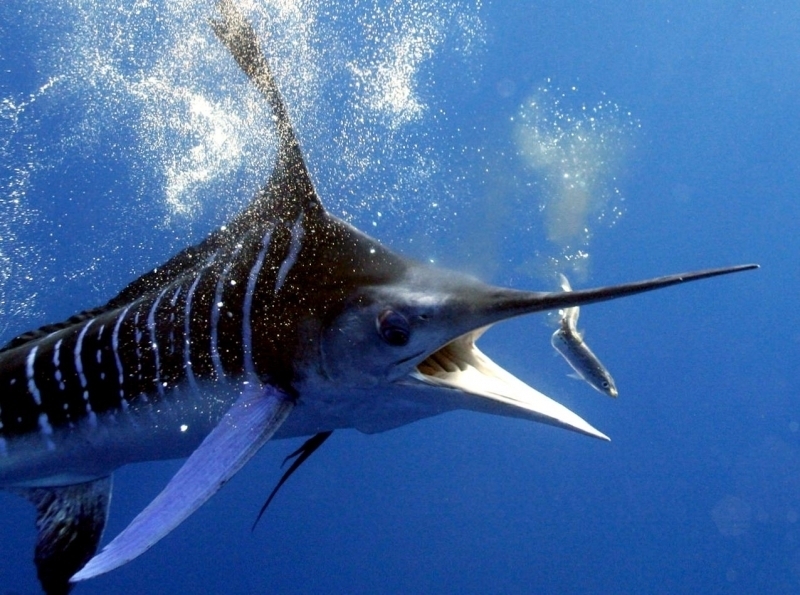 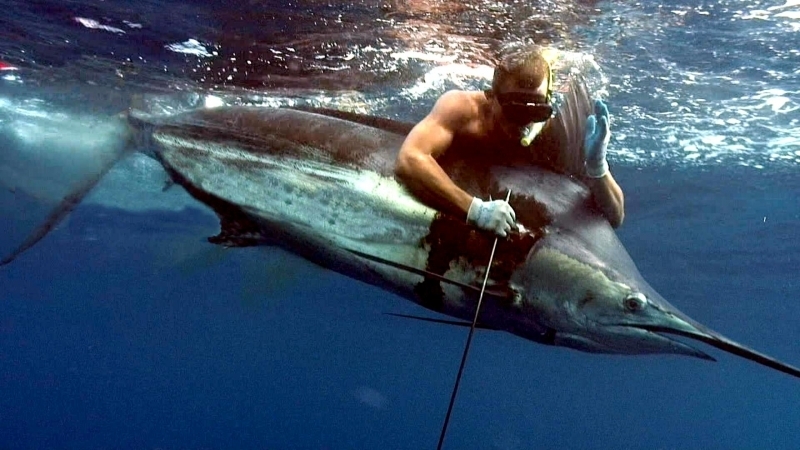 * A Blue Marlin uses its spear-shaped jaw to catch food. 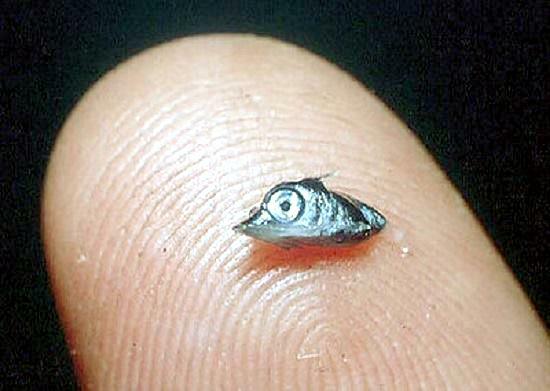 It feeds on crustaceans, fish (mackerel, tuna), dolphins and squids. 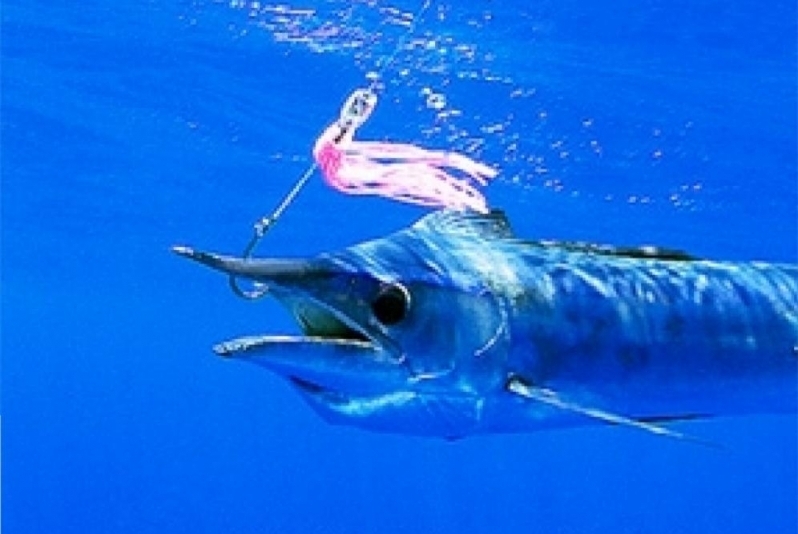 * A Blue Marlin will pass through a dense school of fish and inflict injuries with its spear. 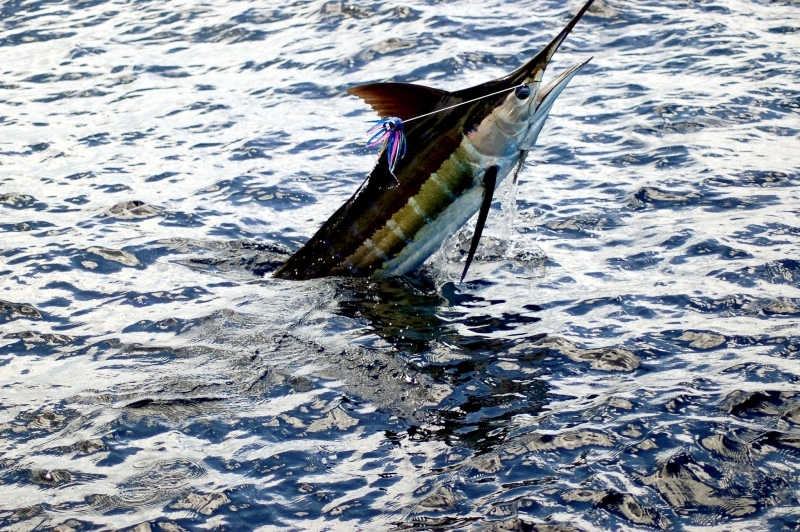 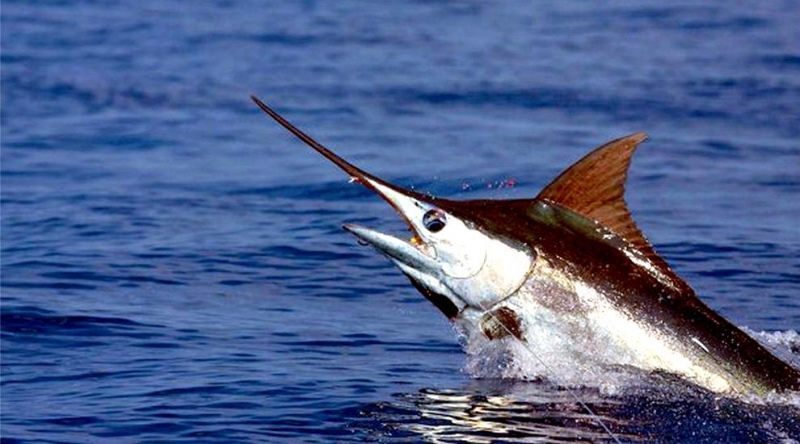 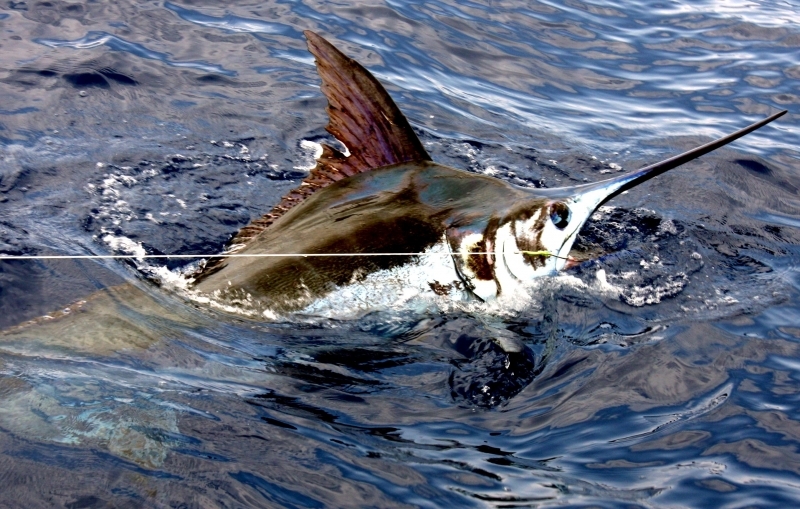 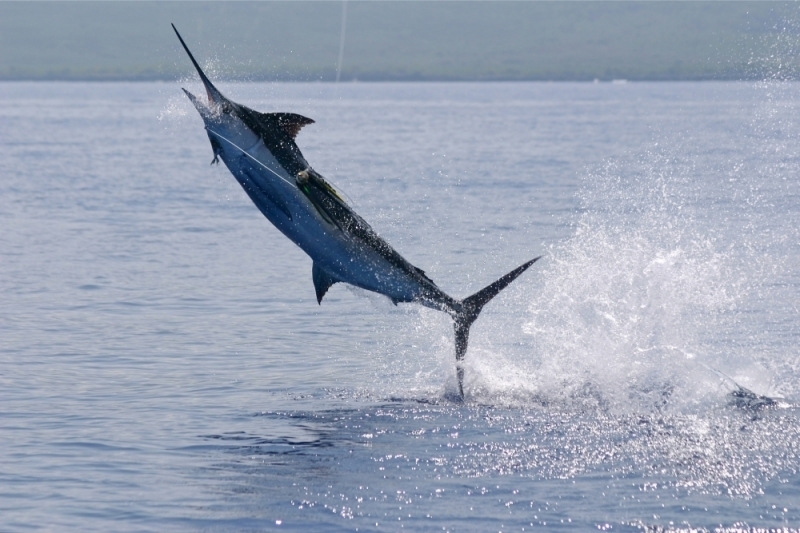 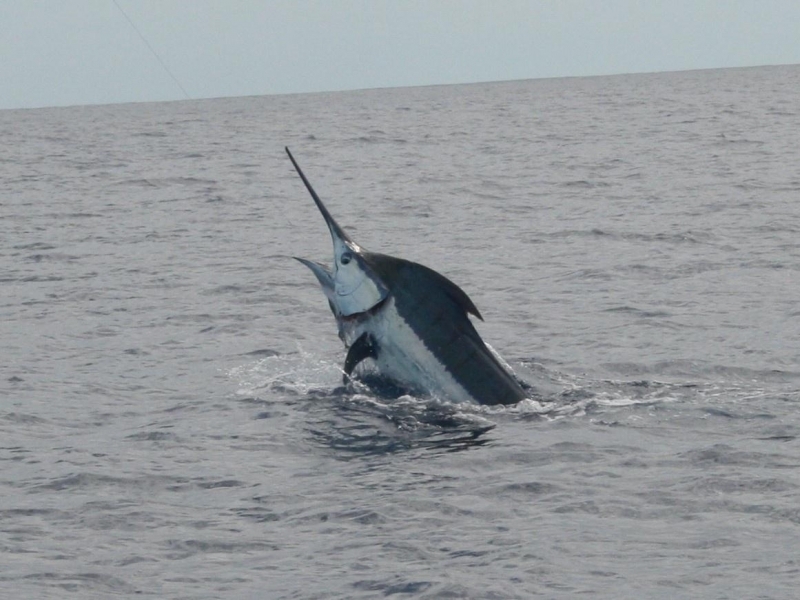 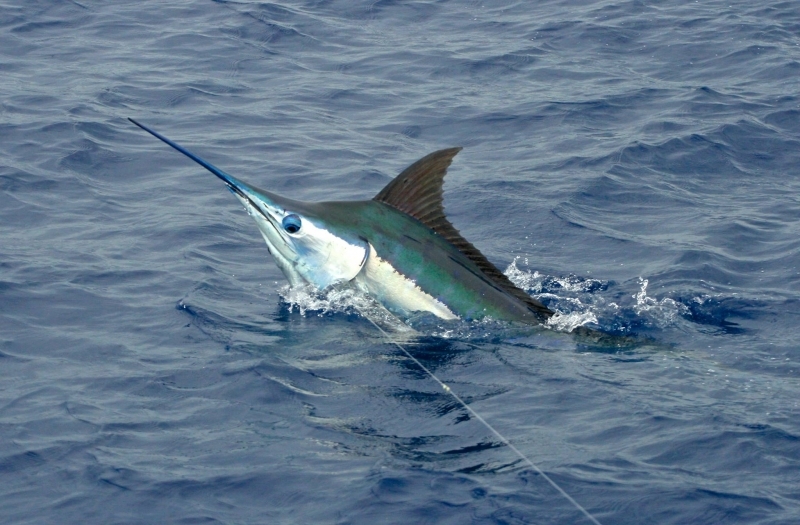 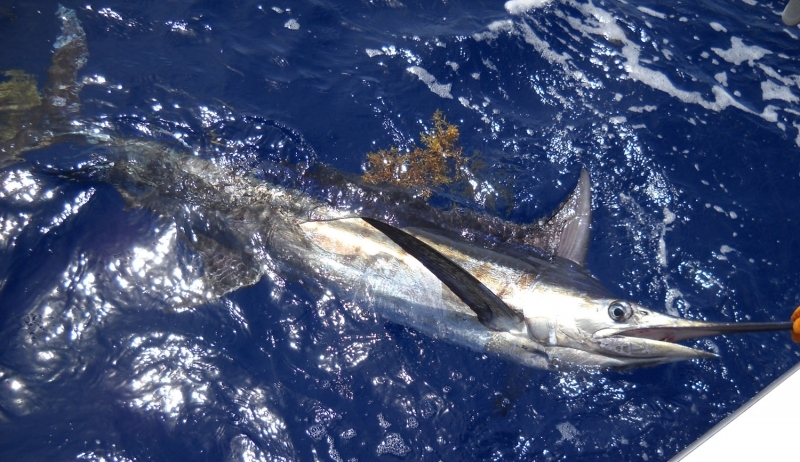 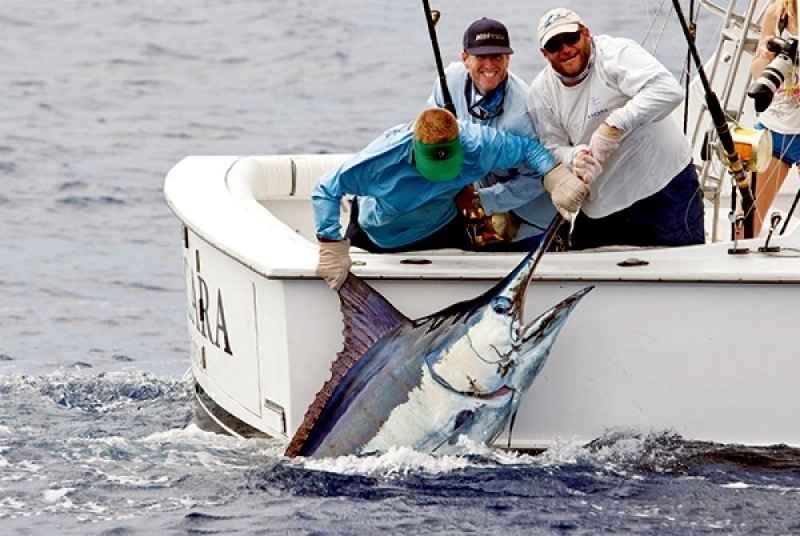 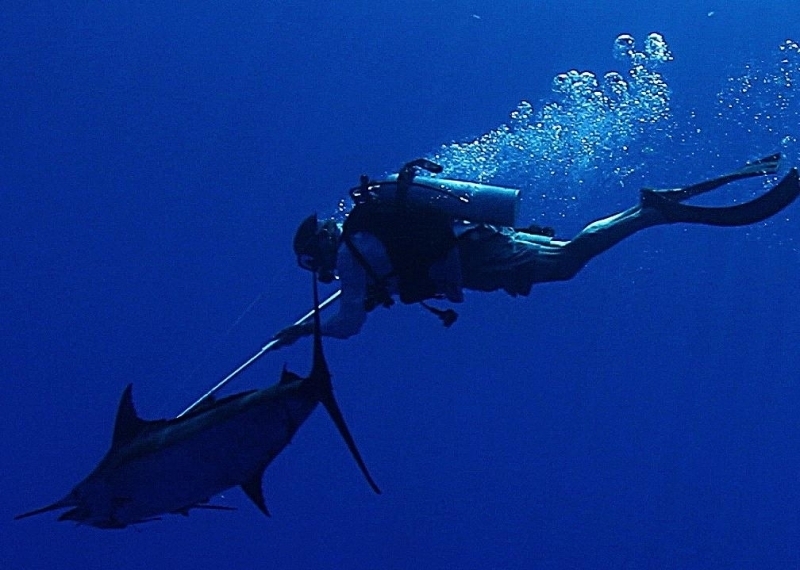 Dead or injured fish will float around and a Blue Marlin will easily scoop them afterwards. 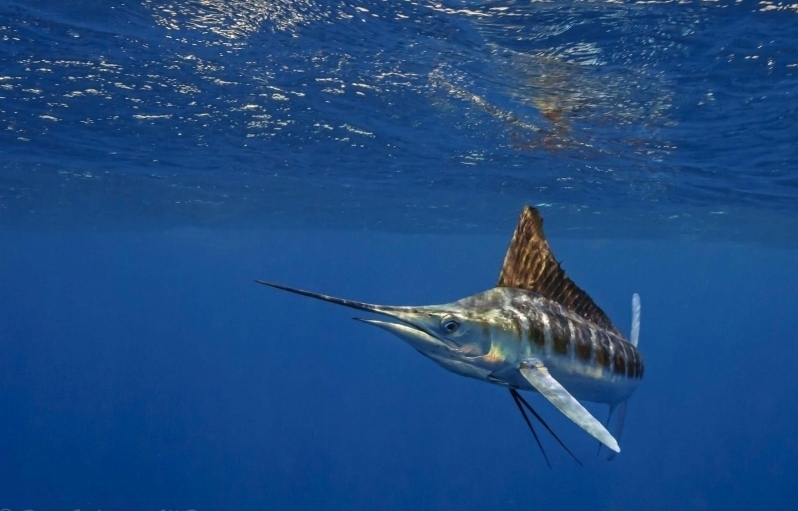 * The Blue Marlin relies on the eye sight to find food. 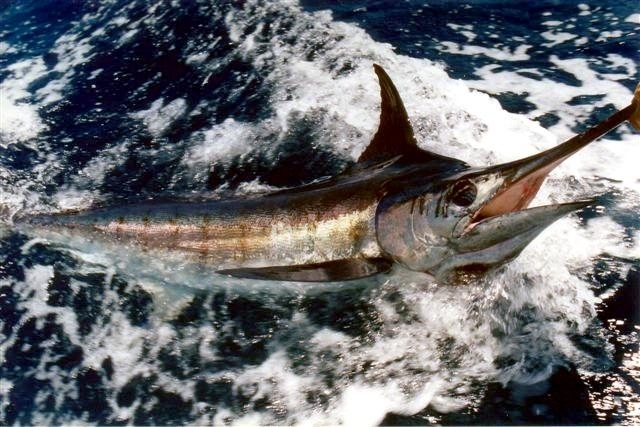 It hunts during the day (diurnal animal). 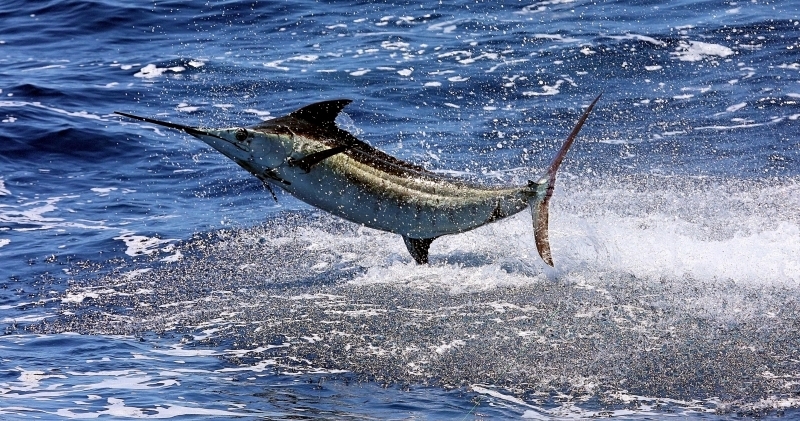 * A Blue Marlin has 24 vertebrae which allow fast movement through the water. 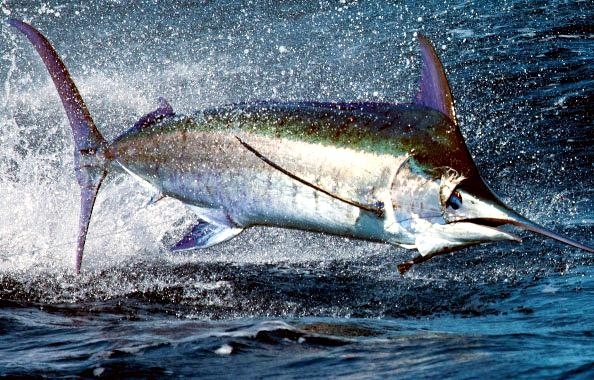 It reaches the speed of 60 mph. 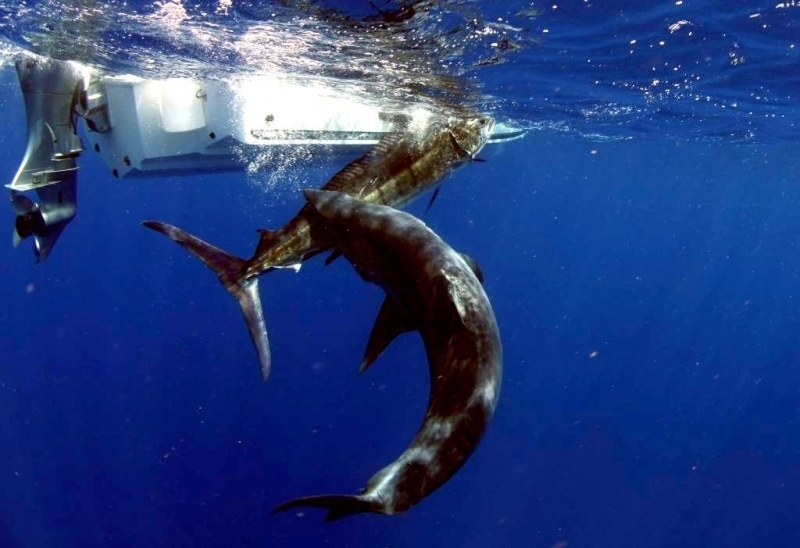 * Because of their large size and sharp spear-shaped jaw, Blue Marlins have only a few predators: Great White Sharks, Shortfin Mako Sharks and Humans. 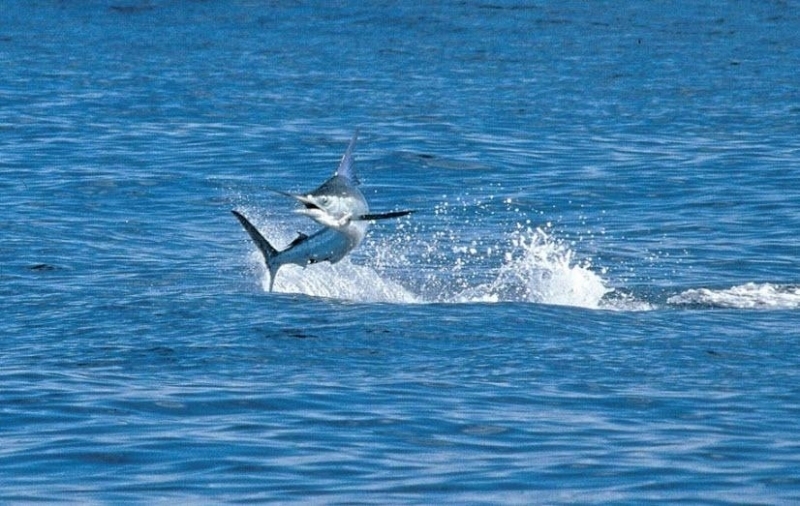 * Blue Marlins are very active & strong animals. 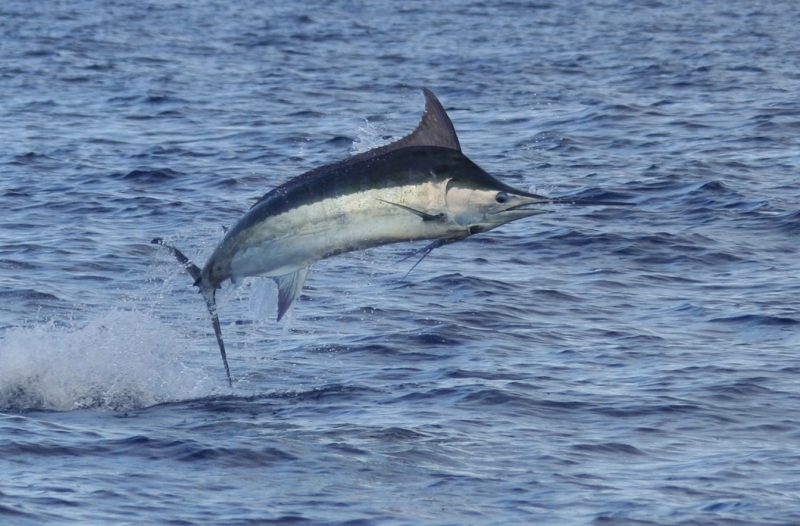 They like to leap out of the water as well they will show powerful & acrobatic movements while trying to release of the hook. 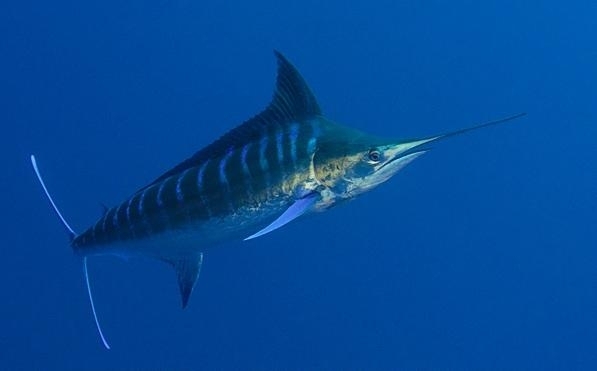 * Blue Marlins are solitary creatures. 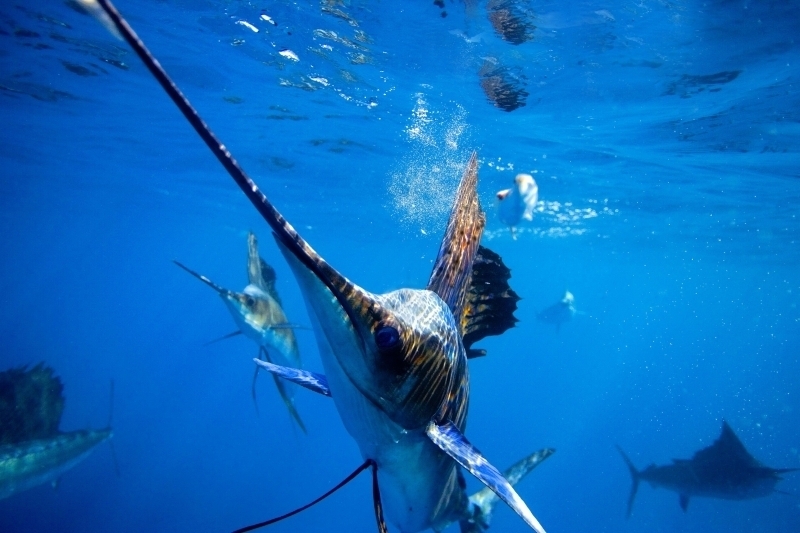 Sometimes they swim in pairs and rarely gather in larger groups. 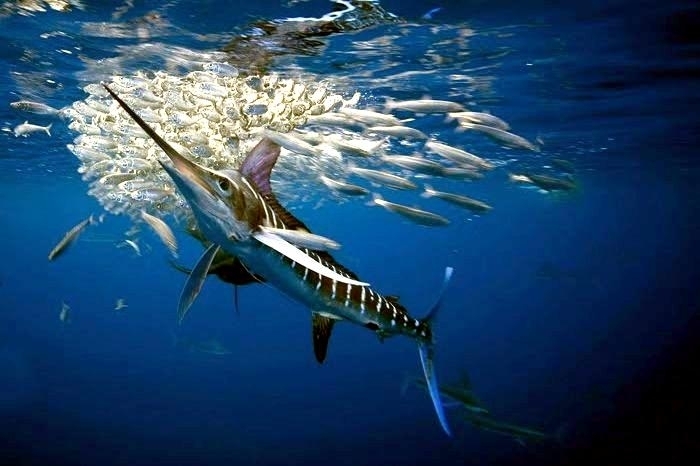 * Blue Marlins are a migratory species. 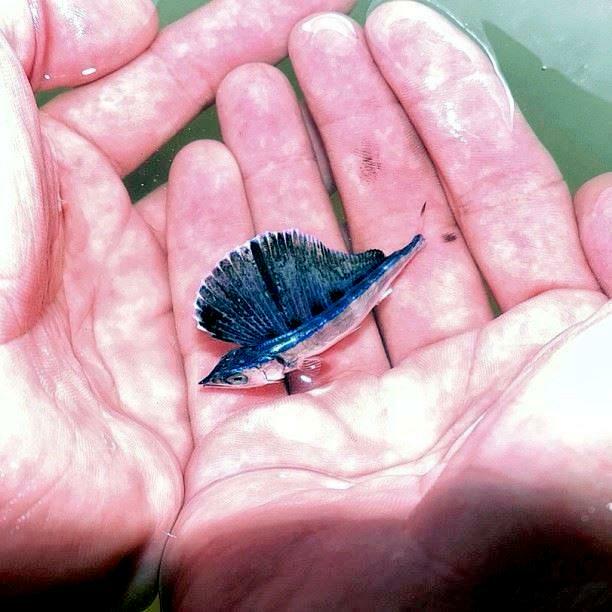 They will move from one location to another to escape low water temperatures as they prefer life in warm waters. 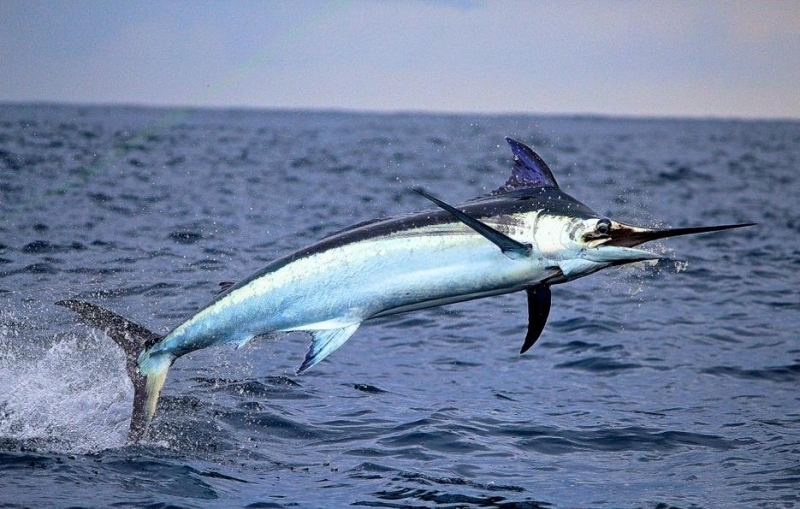 * Mating season of Blue Marlins takes place late in the summer or early in the autumn. 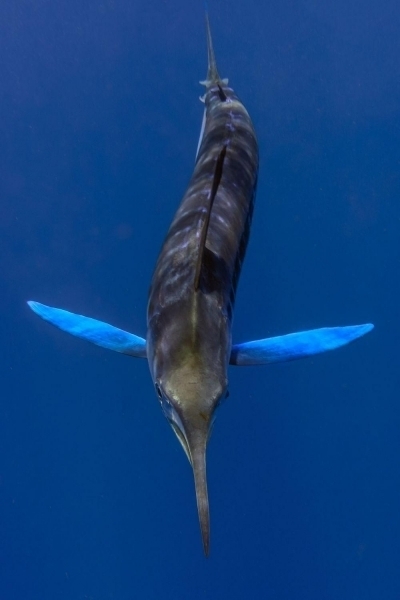 * Females become sexually mature when they gain the weight of 265 pounds. 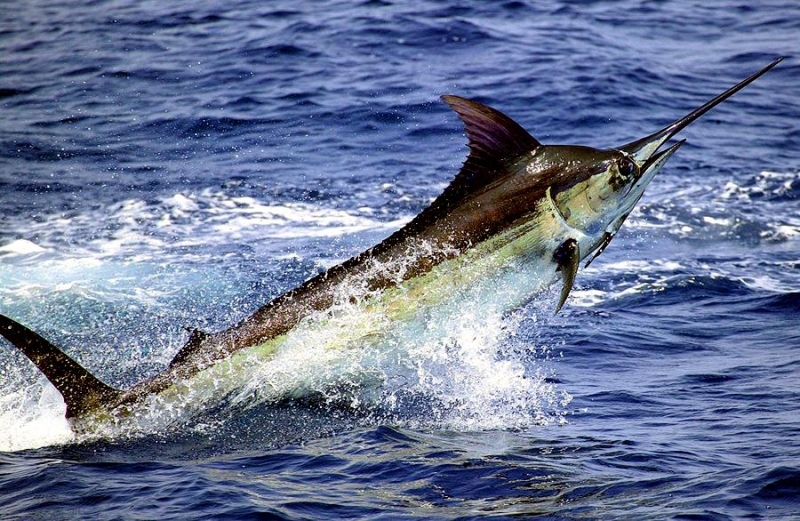 Males reach sexual maturity at the age of 3 years. 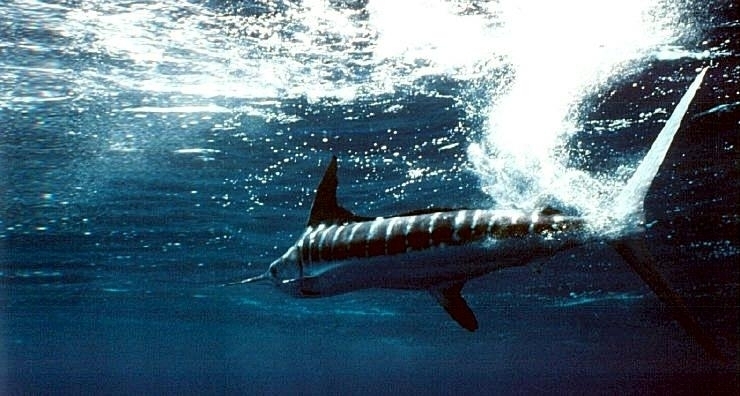 * Females are able to spawn 4 times per single mating season, releasing up to 7 million eggs. 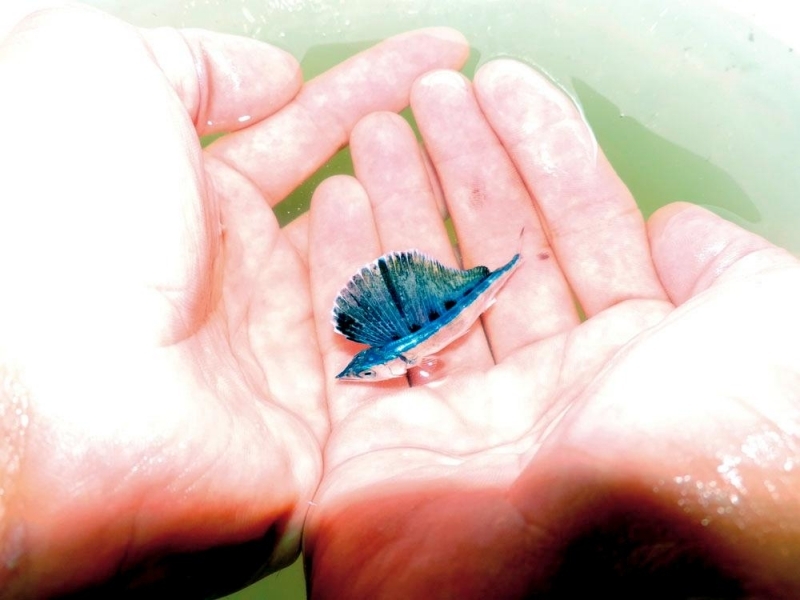 Only small percent of released eggs (less than 1%) will survive until adulthood. 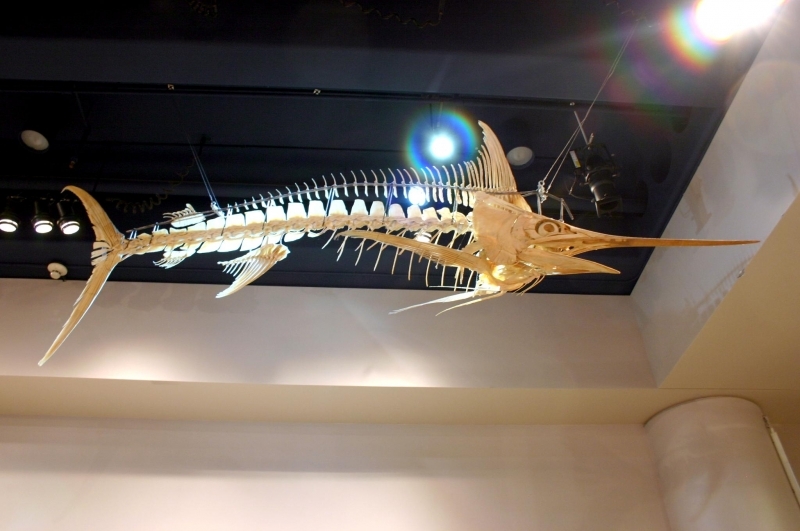 A majority of eggs will be eaten by other marine creatures. 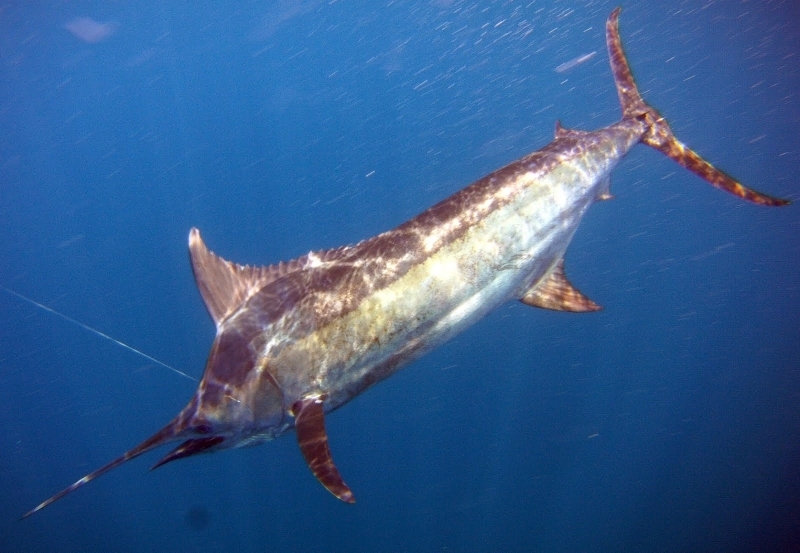 * Average lifespan of female Blue Marlin is 27 years in the wild. 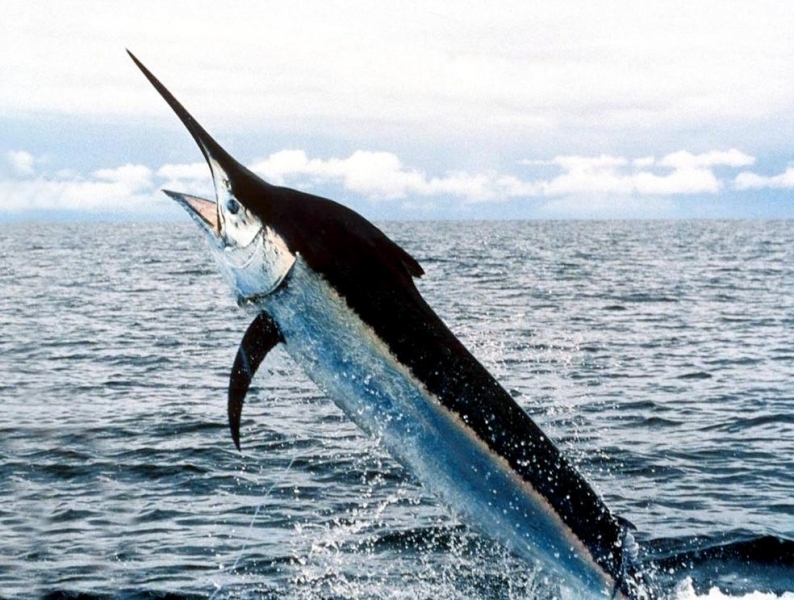 Males live much shorter lifespans, only 18 years.